Amber Romance - A warm, sensual, haunting aroma. Naunces of warm vanilla, sandlewood, patchouli and blackberry blends with musk at the base for an overall rounded, romantic scent. Happy Men - A wonderful masculine scent similar to Cool Water Cologne. Light, refreshing floral and musk notes. 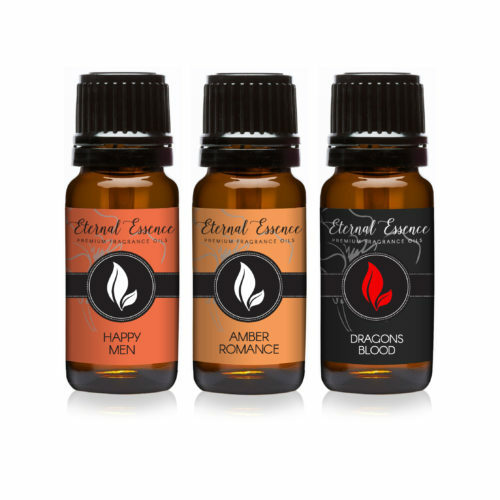 Dragons Blood - This warm tantalizing Oil Fragrance blend of ambers and woods consists of patchouli, rose, jasmine, and floral embedded. It is topped with nuances of citrus and softened with a vanilla and powder base. This is a truly unique and quality aroma. Banana Creamy - Crumbly graham cracker crust loaded with fresh banana chunks, creamy filling, a mountain of whipped cream and more bananas, the perfect Banana Cream Pie. 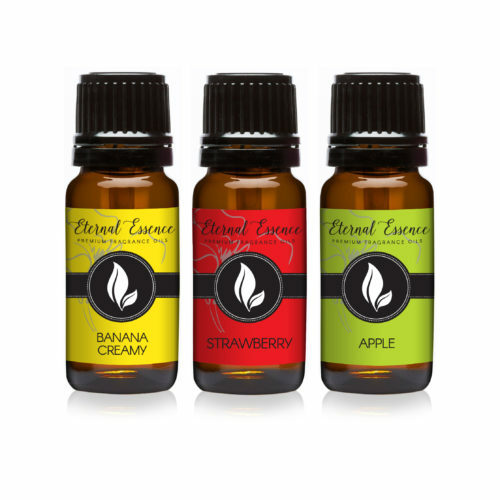 Strawberry - A sweet, ripe, strawberry fragrance with nuances of grape, apple and jasmine. Butterscotch Cookie Dough - Buttery, rich scent that appeals to the sense of taste as well as smell. Nuances of pineapple and banana form the top notes. Mild notes of buttery caramel and sweet butter scotch. Creamy vanilla and powder base notes round out the fragrance. 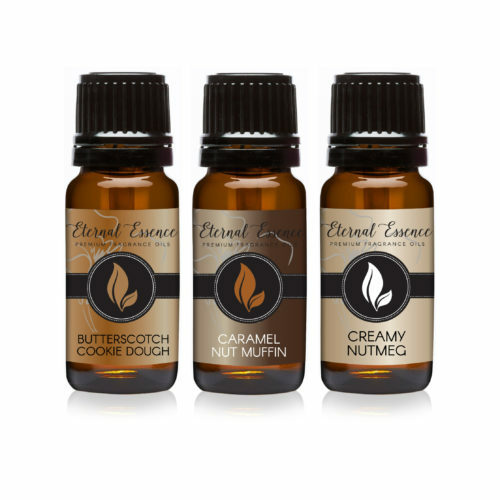 Caramel Nut Muffin - A nutty maple type with top notes of butter cream, almond, honey and maple, middle notes of walnut, cinnamon, clove, banana, red currant and heliotrope, with a woody, tonka bean, sugary vanilla base note. Creamy Nutmeg - A nutty fruity marzipan and berry type with top notes of almond, nutmeg, coconut milk, wild berry and peach, middle notes of cinnamon, clove, and heliotrope, with a sugary vanilla, tonka bean and milky sandalwood base note. Eucalyptus - Penetrating minty fragrance of the Australian tree loved by the koalas. Germicidal, purifying and invigorating. Frankincense - A rich woody, earthy scent with deeply mysterious naunce. Woody top notes with naunces of camphor and musk. Forever Yours - Pink and romantic scent of pear blossoms and lilies. Pretty - A fresh watery fruity floral type with top notes of grapefruit, lemon, peach blossom, water lily, cassis, cucumber, and cyclamen, middle notes of lily of the valley, olive blossom, nectarine, and jasmine, with a woody, musky, vanilla base note. Dark Amethyst - Orange, bergamot, cyclamen, peach, and coconut milk, middle notes of gardenia, lily of the valley, violet, peony, rose and orange blossom, with an amber, musk, sandalwood, tonka bean, patchouli, and vanilla base note. Mermaid - A green fruity floral musky type with top notes of bergamot, mandarin, nutmeg, melon and apple, middle notes of peach, rose, pineapple, violet, coconut, jasmine, cyclamen, and lily of the valley. With a sandalwood, heliotrope, musky, sugary vanilla base note. 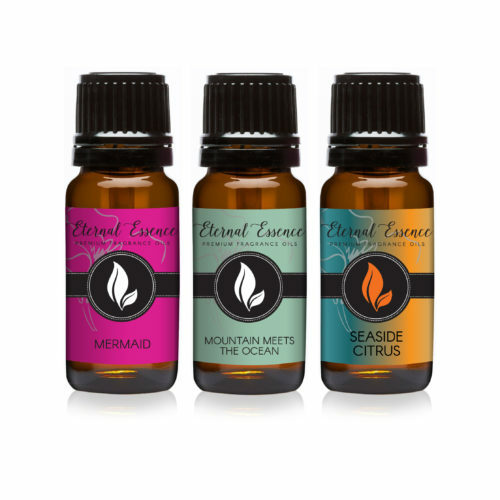 Seaside Citrus - A fruity citrusy and tropical type with top notes of orange, cherry, pear, mango, and pineapple, middle notes of gardenia, green cyclamen, plum violet, jasmine and black currant, with a musky, balsamic, base note. Mountain Meets Ocean - A soft aldehydic floral musk type with top notes of bergamot, cyclamen, melon, and peach blossom, middle notes of rose, jasmine, white lily, gardenia, and violet, with a woody, musky, base note. Ocean Breeze - Green top notes with fresh floral, citrus, muguet and jasmine. Heart notes of hyacinth, rose, carnation and narcissus. A light musk at the base of the fragrance. White Sand - A soft white floral and woody marine type with top notes of grapefruit, pear, and pineapple, middle notes of lily of the valley, violet, jasmine, rose, gardenia, and heliotrope, with a mossy, woody, tonka bean, patchouli base note. Pink Splash - A fruity sugary floral musky type with top notes of orange and bergamot, middle notes of pear, and cyclamen, with a white musky, vanilla and powdery raspberry base note. Secret Crush - A fruity sweet pea and pear type with top notes of green apple, grapefruit, melon, lemon and pineapple, middle notes of strawberry, peach, rose, jasmine and plum, with a mossy, sugary, musky base note. 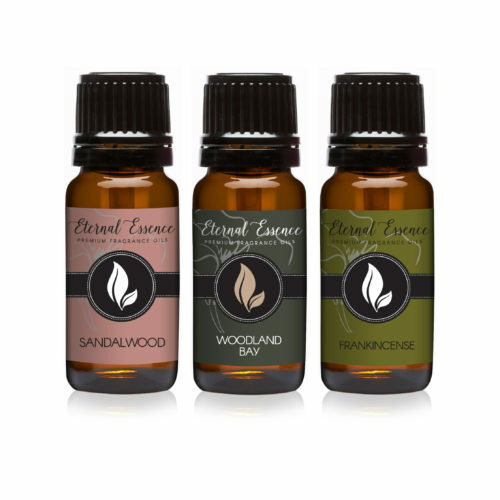 Sandalwood - Top notes of jasmine greeting cedarwood and gardenia mid notes. A rich sandlewood and musk at the base resonates throughout the fragrance. Ylang Ylang - This lush, exotic scent is strong, clean and complex. 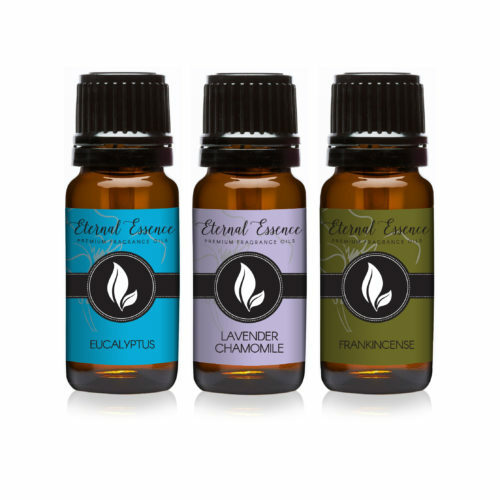 Top notes of muget, ozone and ylang ylang blends with notes of rose, jasmine and powder at the base. Sandalwood - Top notes of jasmine and mid notes of greeting cedarwood. A rich sandalwood and musk at the base resonates throughout the fragrance. Woodland Bay - This fragrance Oil is a spicy, masculine, and nautical blend. Frankincense - A rich woody, earthy scent with deeply mysterious naunces. Woody top notes with naunces of camphor and musk. Almond Coconut Milk - A creamy milky coconut –nutty type with top notes of almond extract, wisteria, orange and coconut milk, middle notes of jasmine and heliotrope, with a tonka bean and sugary vanilla base note. 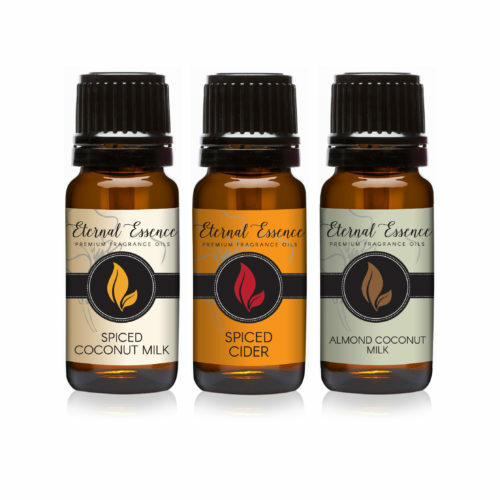 Spiced Coconut Milk - A nutty, spicy, and creamy type and with top notes of coconut, peach, nutmeg, almond and lemon. Middle notes of cinnamon, cardamom, clove, walnut, maple, and heliotrope, with a creak tonka bean and sugary vanilla base note. Coconut Lime Verbena - A tropical citrusy pina colada type with top notes of lime, lemon, mandarin, coconut and pineapple, middle notes of melon, cyclamen, and peach, with a woody sandalwood and white musky base note. Bahama Berry & Melon - Ripe, sweet berries and succulent melons combine to form this unique fragrance. Top notes of citrus, berries with naunces of pineapple. Sweet peach, honey dew melon and jasmine are at the heart. A whisper of musk at the base. Twilight Woods - A creamy floral woody type with top notes of orange, peach and pear, middle notes of iris, jasmine, lily and rose, with a soft powdery musky, woody amber and tonka bean base note. Sugar Kiss - A soft fruity floral and sweet musky type with top notes of apple, creamy peach, coconut and plum, middle notes of white lily, jasmine, violet, pear, and heliotrope, with a woody, amber, musky, tonka bean, and sugary vanilla base note. Juniper Breeze - A heavy mixed fruity type with top notes of pineapple, orange, grape, melon and peach, middle notes of rose, jasmine, cyclamen, violet, apple, lily of the valley, and clove, with a woody, musky heliotrope base note.